Furano, Hokkaido has beautiful summer season where you can see the beautiful colors of nature everywhere. July is the best time to see the lavender in Furano Lavender Farm, Hokkaido. Although there are several lavender varieties with different blooming schedules, the main bulk of flowers opens towards late June, reaches full bloom around mid July and declines in late July and early August. Many flower farms welcome you with the amazing colorful patterns of flower fields, including the famous, “Tomita Farm”, which is near to Lavender Train Station. “Saika Farm” is also very beautiful and about 2.5km from Tomita Farm. 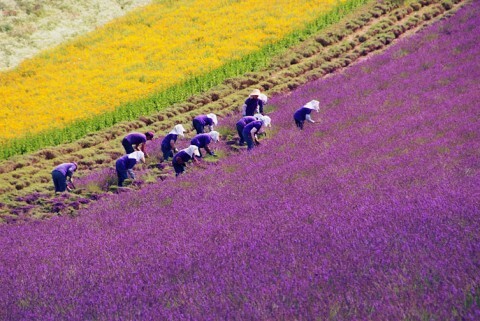 They have the large lavender farm, and the different taste from Tomita Farm.